In the Spring of 2018, we installed a 9-hole footgolf course on the existing back nine at MariMack. Think golf, get rid of the clubs, use one of the two "clubs" (or feet) you were born with, and get the soccer ball in the hole with as few kicks as possible. The Footgolf course MAY NOT ALWAYS BE OPEN. You should always check with our website or with the counter. No Footgolf on Thursday evenings from 5 PM - 7 PM. In May, this will be expanded to Friday nights. 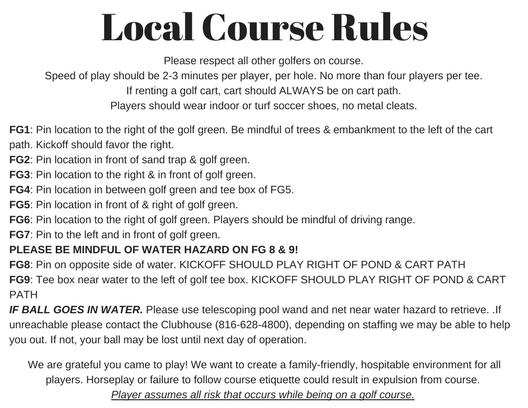 You may be on the course at the same time as regular golfers, you WILL be expected to observe proper course eitquette and observe the flow of play. Never disrupt the golfers. You will be given a more detailed rules sheet and expectation sheet at the counter at check-in. You should read this. We are brand new to this, rates and policies may be subject to quick revision and change.